A: Jack, the injury to your son sounds as if it has affected him mentally and he may be shy of getting hit again. Hence, why he is pulling out away from the ball. You must remember that this is a natural reaction, especially to younger kids. Give as much positive reinforcement as possible and have patience. The last thing you want to do is scare him off. It takes time and everyone is different. In the mean time, when he is practicing his hitting, try and pitch on outside of the plate and make him practice steppping into the ball and hitting it to left field. This should help him get back to normal and not as much pulling out. Like I said before, BE PATIENT, and best of luck. Q: Sam, if you had a 10 year old son with strong aspirations of playing college and maybe even in the majors, what would you be doing with him or for him? For what it’s worth, he is often the best or one of the best players on the field in any game he plays in. Thank you in advance, George. A: George, if your son is only ten years old and has big aspirations….then good for him. Sounds as if he is a good player at his age level. Let’s hope his skill level grows with his age and his does get the chance to play college ball. My advice is just let him play as much as possible. Repetition is key at any level. When he gets into high school there are alot of camps and tryouts that help slot your son into college. I would be able to help better at that time. Let him play,play,play. Best of luck. My 8-year old son is a great hitter. However, he was hit twice in his first 2 games by the pitcher and now he is petrified of the ball. He steps out of the box and doesn’t even swing his bat. I’ve been pitching to him as well as his coaches and he has no problems. He gets scared when a kid his own age pitches, I guess from lack of trust. It’s taken a big toll on his game and playing time. What can I do to help him overcome his fear of the ball? A: Laura, this is similar to Jack’s issue above. I will tell you the same thing. He is definitely shy of getting hit with the ball. Have patience!! This happens to alot of kids and it just takes time for the fear to go away. Give plenty of encouragement and positve reinforcement. Each kid is diferent and each one takes his own time. BE PATIENT ! Hopefully he will come around sooner or later. Sounds like if he was good before he will be good again. Just hang in there and continue to give him chances. Good Luck ! Q: Sam, a rather fundamental question here. In what situations should a catcher run down to back up first base? Thanks. 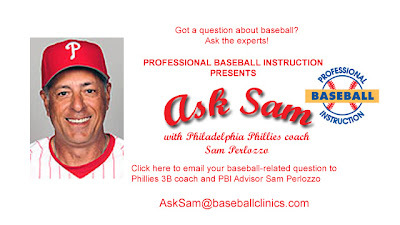 A: The catcher should back up first on all ground balls to infielders with no one on base. Anytime there is a runner on base there is always a chance that the ball could kick around and the runner try and score. There are times that he can cover with man on first as long as he tells the pitcher to cover home…. General rule is never to leave home plate uncovered. Hardly ever will he back up first with a man on second. There are different angles and balls hit that backing up first by the catcher would be a wasted effort..ie bunt to 3rd baseman. Situations change during play, but generally, as long a a runner is on, he has a chance to come around and score. Hope this helps!! Thanks to everyone for all the great questions. Hope you all have a great New Year and I look forward to hearing from you. Send your questions to me via email – AskSam@baseballclinics.com.